Local collector and independent curator H. Elaine Jackson has, over a period of nearly four decades, acquired and exhibited work by prominent mid-20th century artists-of-color drawn from the continental U.S., as well as practitioners from the Caribbean basin and Africa, with a deliberate focus on the graphic mediums. The exhibition at the Brentwood Arts Exchange in February 2018 will feature selected works representative of four decades of collecting. The corpus of the exhibit focuses on four prominent mid-20th century NYC based practitioners -- Romare Bearden, Herbert Gentry, Vincent Smith, and Norma Morgan but also brings together a cross-section of work spanning several generations of female artists offering a referential point-of-view touching on the multiple roles imposed on and displayed by women -- mother, goddess, object, muse. Attitudes are catalysts for new processes, and re-envisioned ways of making. To use any material, or even to make work that is ethereal, arises from widely varied practices, but always embodies the artist’s attitude about creating. Furthermore, to act with style and intention in creating articulates and shares the position of the artist. Pushing the boundaries of art informs not only making art but also seeing it. For this Mini Solo Exhibition, Daniel Christie's high-fired, wheel-thrown pottery demand a 360º examination. With their play of textures, details and volume these vessels showcase the artist’s deep passion for the clay medium. He produces pottery items in various scales with a sculptural focus that also seeks to be functional--specializing in stoneware bathed in bright, colorful, glazes. Daniel works out of his handmade home studio in King George, VA.
Liz Lescault is a local, seasoned ceramic artist with over forty years of experience. She brings to us a series of elegant biomorphic sculptures and vessel forms, which showcase her mastered ability in designing, firing, and glazing different kinds of clay. Inspired by shapes usually found by the sea shore, her creations are able to transport to an earthly paradise, with patterns full of rhythm, and a glaze treatment that mesmerizes the eye. 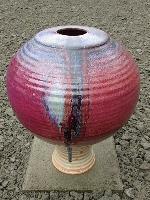 Liz specializes in high-fire functional pottery, pit-fired and “terra sigillata” vessels. She has lived in Botswana and Lesotho, where she studied the techniques of traditional African ceramics. Liz's current studio is located in the Otis Street Art Project, Studio and Art Incubator in Mt. Rainier, MD. Methods explores formal, material, and conceptual approaches to investigating identity as personal narrative and shared experience. Featuring artists from across the DMV, Methods challenges the boundaries of traditional media and found materials to reexamine how we see form and understand meaning in art. Featuring: Roxana Alger Geffen, Rodrigo Carazas, Chanel Compton, and Wayson R. Jones. Featuring: Leda Black, Melissa Burley, Eric Celarier, Katie Dell Kaufman, Annie Farrar, Zofie Lang, and Fabiola Yuricisin. Attaching meaning to the things around us among the most fundamental aspects of what it means to be human. We value many things not for what they are, but for where they came from, who gave them to us, or what they help us remember. Other things take on spiritual meaning, or link us to histories and traditions. 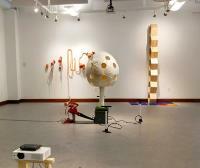 Material – Object – Form explores the ways that artists use these relationships to develop the content of their artwork. 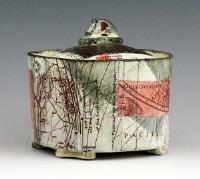 Kanika Sircar makes use of maps and texts as central images in her sculptural vessels and tiles. Prints of charts and excerpts of poetry are layered over slips, stains and pencil drawings. Maps are employed to evoke both certainty and doubt, pointing to where we assume we are and the arbitrary nature of that assumption. Thought provoking and beautiful, her pieces variously reference Vedic cosmography, diagrams of the Copernican universe, drawings of Martian topography, and the documents and plans of India’s partition. Brent Pafford creates work that is a reaction to the time in which it is being created, reminiscent of objects that have been passed down or inherited, that he cherishes and values. He creates contemporary heirlooms: counterpoints to disposability, utilitarian objects imbued with touch and labor, time and energy. Re-Locations explores the way that representation influences our understanding of place. Artists Morgan Craig, Joey Manlapaz, and Trevor Young each address our relationship with the spaces around us through representational painting. Yet, each of their approaches creates a very different understanding of what their subject mean to us as a places – Craig with lush, saturated colors evocative of decay, Manlapaz with a precision that can be at once familiar and distant, and Young with an uncanny use of light to create emotional charge. Together, their grouping of work in Re-Locations focuses a spotlight on the power of artists to interpret and imbue our lived environment with meaning. Drawn Out, Drawn Over: Mapping the Territory of Experience aims to field a visual conversation about drawing approaches by featuring 18 selected artists living throughout the United States, most of who have had devoted careers as academics. Their institutions range from small liberal arts colleges, community colleges, and some of the largest research institutions in the country. Matt's Spiderweb series is all about line and movement. The constricting web of a spider is made up of intricate lines that perfectly trap its prey. Matt designed this series based off of that complex design. The Interlocking of lines in his pieces trap the viewer in constant movement. 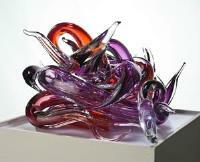 Color also plays a major role, as each piece uses various colors trapped in clear glass. This exhibition will feature work from the children's wildlife program, "Get to Know." This educational wildlife organization was founded in 1999 by painter and naturalist Robert Bateman. During this program children have the opportunity to engage with nature in a way that may not be built into their daily lives. "Get to Know" encourages an active lifestyle while interacting with nature. The connections and discoveries made outdoors will be explored through artistic projects and exhibited in our gallery. District Clay is a ceramic studio in NE DC neighboring the Gateway Arts District, and is devoted to all aspects of clay craft in the DC area. The studio offers ongoing classes for beginning, intermediate and advanced ceramic students in wheel throwing and hand-building, and includes a Community Artist program for more advanced studios who wish to pursue independent study. The driving purpose behind District Clay is to create a “clayspace” where students can learn the craft while also stretching their creative abilities. Their motto is to “Seize the Clay!” To that end, the studio offers periodic special Masterclasses and Workshops with experienced potters and ceramic artists. Curator Jennifer Lindsay Brings together two sculptors, Laurel Lukaszewski (ceramics) and Joseph A. Corcoran (glass) to create site-­specific installations for the Brentwood Arts Exchange. 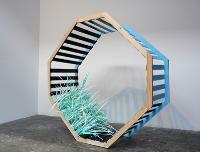 Using collaborative installations as a way to intensify the viewer’s immersion in a transformative or revelatory experience, Lindsay will juxtapose works by both artists, from miniature to monumental, illuminating each artist’s individual responses to materials, nature, culture, and the environment. The Exhibition will also highlight the durable influences of global traditions, and of the early twentieth century’s radical movements in art and design, on contemporary art and craft, and in the works on view. Jeff Herrity is a ceramic artist and native Washingtonian. 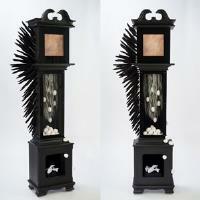 Jeff makes surrealist figurines that are created from vintage plaster molds of angels and other objects that he finds. 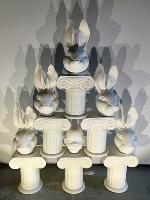 His work is based on the memories of ceramic figures his mother made when he was younger. His surrealist figurines or ‘dolls’ have become popular collectible items. The series of dolls were first shown at the Hillyer Art Space in 2014, then the Fridge Gallery in 2015, and now at the Hirshhorn Gift Shop – they were sold to support the Marvelous Objects: Surrealist Sculpture from Paris to NY show which ran from late last year to early 2016. 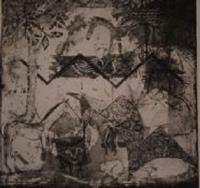 Between the Real and the Imagined explores the interpretation of nature in imaginary and fantastical forms. It uses imagination, observation, and invention to transport us to a place where things we recognize as nature blur seamlessly into places we know aren’t real. Chevy Chase, MD-based artist Carol Barsha creates colorful paintings of garden scenes that are as enjoyable in their playful, painterly style as they are in their stylized depictions. Brunswick, ME-based Jackie Brown constructs sculptural biomorphic installations that evoke mutation, growth, and movement, and expansion with an ambiguity that hovers between playfulness and malignance. Prince George’s County has a long history of supporting our military personnel. This exhibition seeks to cultivate artistic support for veterans and active duty members to highlight the role art can play in the healing process of returning from deployment. The exhibition will showcase artwork by veterans and the military community using the creative process to promote healing, and provide insight into artistic expression as a tool for understanding the transition from military to civilian life. 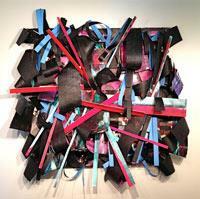 Artist Imani Russell has a long history working with cloth, found objects, and notions. Influenced by the women in her family who hand sewed for utilitarian purposes, and inspired by her research of the culturally rich Gullah people, this artist is fascinated by unique hand stitches and varied fabrics. Also a small business owner, Imani has owned and operated Indigo's Friends, a line of cloth art dolls and notions for over the past two decades. "The colors and textures of cloth, new and old, lures me, then permits me to manipulate and recreate a thing of wonderfulness; often manifesting decorative art dolls and wall collages or cozy scarves and bed quilts. Hand-stitch after stitch, I endure until I achieve a rhythm that reveals the soul of the piece; then I weave in found objects and contrasting textures." It's said that the arts require a lifetime to master, and learning must continue throughout our lives. "Boundless: Aging and Creativity" explores the benefits of lifelong learning and the relationship that the stages of our lives have with artistic creation. Curated by students at the University of Maryland College Park, this exhibition features four Maryland-based artists who have had very different, but highly accomplished career paths and who are in creative prime: Alonzo Davis, Dorothy Fall, Bertrand Mao, and Valerie Watson. Supported in part by the Foxworth Creative Enterprise Initiative at the University of Maryland. Fran Solar is a contemporary Canadian artist who combines traditional textile techniques with unconventional materials to create unique woven sculpture, both free standing and wall mounted. Fran enjoys using 'masculine' materials and hardware pieces - washers, electrical whatevers, bike parts and gears - and turning them into quilts and basket vessels with more of a domestic/feminine dynamic. She is intrigued by the ways that the shapes, patinas, and colors of prosaic materials and objects can be recombined into a different pattern in a new context. Al-Mutanabbi Street Starts Here is a book arts and cultural festival planned for January through March, 2016, throughout the Washington, DC area, organized under the auspices of George Mason University, a charter committee of non-profit organizations including Mclean Project for the Arts, Brentwood Arts Exchange, Cultural DC, Split This Rock, Smith Center for Healing and the Arts, Martin Luther King Public Library, Arab America, and Busboys and Poets. This exhibition at the Brentwood Arts Exchange features artists’ books, broadsides, and letterpress work created for related Al-Mutanabbi Street Starts Here festivals in San Francisco and Boston. The art, related exhibits, programs, and events were inspired to commemorate the 2007 suicide bombing of Baghdad’s historic bookselling street by celebrating the free exchange of ideas and knowledge and standing in solidarity with people everywhere that free expression is threatened. Jewelry designer and artist Carol-lynn Swol is making her mark in the local art jewelry world with very durable, yet different materials. Her use of Tyvek, a thin plastic that looks and feels like paper, with metals such as brass, copper, silver, and karat gold fill her arsenal of impeccably crafted items. She uses various techniques to create patterns on her wearable jewelry, including a vintage, early 20th century hand-cut steel stamping set. Carol-lynn explains that her work “could be considered limited production rather than one-of-a-kind production, but no two items will ever be exactly the same." This exhibition commemorates Millennium Arts Salon’s (MAS) commitment to art and culture in the Washington, DC area for over fifteen years. Participating artists featured in this exhibition foster the dialogue between cultural consciousness, social expectations, and human emotion. Abstract forms, fictional characters, and symbolic representations give us an entry point to an open-ended exchange about human connectivity. 2014 may not have marked the year the art world stopped being aloof to reality TV competitions and built on what they have to offer, but it’s the year we did. And, based on public response, you did too. More than 5,000 votes came in to Project America’s Next Top Master Artist, selecting a champion and awarding a solo exhibition to Cheverly-based artist Ellen Cornett. Celebrate with us and share in the results of connecting artists directly with audiences. Ellen's drawings and paintings are inspired by the comic humor and serious, sometimes tragic undertone of certain poems, short stories and fairy tales. She strives to make something intriguing and meaningful from well-recognized sources, manipulating characters into odd vignettes of conflict, misunderstanding, and relationships gone awry. 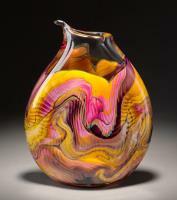 Allen has been creating custom wood turning art in his studio in Annapolis, Maryland since 2001. Most of his pieces are turned from tree species indigenous to the central Maryland area, and are recovered from downed trees that would otherwise be dumped into landfills or burned as firewood. 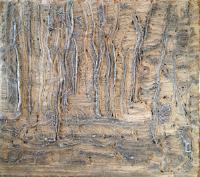 His artistic goal is to highlight as much of the natural figure, texture and color from the wood as possible. Simple shapes combined with graceful curvatures amplify the beauty of his turnings. At War with Ourselves is a year-long series of programs investigating and learning from the legacy of the Civil War on race in America presented across regional partnerships with the Clarice Smith Performing Art Center and centered on a new work of poetry The Clarice commissioned by Nikki Finney. This exhibition invites members of Black Artists of DC to respond through visual art to Nikky Finney’s poem – released to artists before its official publication – utilizing art to contribute to a national conversation about the history and experience of being a black male in the United States. Kristi Kelly shows the intricate beauty of glass using venerable lampworking techniques to make one-of-a-kind beads and glass decorations. 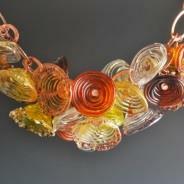 She combines her glass creations with delicate metal enhancements to make some of the most beautiful and unique jewelry around. This is art you can own and wear. Each piece is hand-designed and caringly constructed to make a statement, and yet be harmonious and versatile. All her pieces are durable, despite their fragile appearance. Select and enjoy your own unique piece of wearable art! It seems like art centers grow up so fast these days. One minute they’re an abandoned building, the next minute they’ve worked with hundreds of artists as a hub for a vibrant, dynamic Gateway Arts District Community. The 5th anniversary of the Gateway Arts Center and the Brentwood Arts Exchange and 39th Street Gallery within it is March 19, 2015. To celebrate, the Brentwood Arts Exchange brings together selected artists from its exhibitions over the past 5 years to reflect about where we’ve been and look forward to where we’re going. Bill Donaldson is an award-winning Annapolis architect and artist. 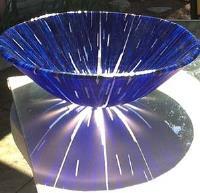 For the last several years, Bill has worked exclusively in kiln-glass. 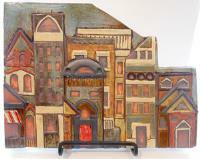 The results are amazing one-of-a-kind, plates, bowls, vases, sinks and larger architectural panels. People often speak of taking a “journey” through art. It’s been said enough that in our fast-paced information environment where it’s more normal to scan and move on than to consider things deeply, it’s easy to forget what that really means. Artists Pat Goslee, Ellyn Weiss, and Sally Resnik Rockriver each use art as a method of discovery, responding to forms and materials then building on them to find what’s there. Whether it’s finding the balance in giving up control to a chemical reaction, investigating material properties, or the conscious act of constructing energetic movement through paint, all three artists make provocative statements about the ways that meaning is created through the interaction of process with form. Together, their exhibition invites us to open up to things we don’t know, things that aren’t written out first then repeated as art, where our paradigms don’t fit, areas Unmapped. 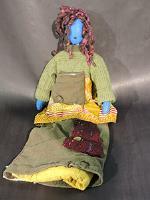 The Brentwood Arts Exchange is pleased to highlight the works of 15 different local women who participated in a self-esteem building workshop through the art of doll making taught by The Ragbaby Exchange. Owner and instructor Sherri Lumpkin holds various workshops throughout the DC, Virginia, and Maryland area to help empower women of all ages to find their inner beauty and realize personal goals. 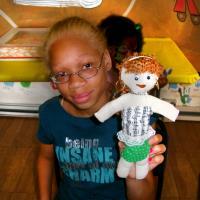 Regina Gilmore and Darby Baham of FRONTLINE News wrote, “Ragbaby Exchange utilizes art as therapy and moves the participants to inner reflection through affirmations, visioning, and doll making. The purpose is to help participants discover their own self-worth and develop life skills that enable them to realize their choices.” The Brentwood Arts Exchange will be partnering with The Ragbaby Exchange to host a one day workshop in early May 2015. The annual Prince George’s County Juried Exhibition returns to the Brentwood Arts Exchange with Prince George’s Sampler – an exploration of the diversity and richness within the county’s art community. Prince George’s Sampler features visual art in all media by artists who live, work, or study in Prince George’s County, from those who forged the county’s rich traditions in the arts over the decades to those who have moved here in recent years to become a part of it. The annual County Juried Exhibition is always a crowd favorite; this year’s is sure to not disappoint. Axis is an exhibition of visual and literary arts created by 13 artists linked into an alliance by the common experience of having been fellows at the Virginia Center for Creative Arts. The title “Axis” suggests a center or core that is capable of connecting, changing, and moving things, people and ideas to create a multitude of possibilities and alliances; it is a crucial transformative concept at this point in history. Fitting with the title, this exhibition brings together contemporary artwork by artists from across the United States whose work connects in spirit while it diverges in form. The Brentwood Arts Exchange and The Arc Prince George’s County celebrate two years of making art together with this exhibition of artwork created by The Arc’s Day Center participants in classes at the Brentwood Arts Exchange as well as the Day Centers. The Arc is the world's largest grassroots organization committed to the welfare of people with developmental disabilities and their families. The Arc of Prince George’s County’s members include people with developmental disabilities, their families and friends, the professionals who work with them, and other concerned citizens. Our partnership in making art together is a demonstration in the talent and creativity of our too-often underserved neighbors, friends, and family. If you missed the 2013 show Artists of the Arc of Prince George’s County, this is your chance to be impressed. Providence Center has been leading the way for thousands of Marylanders with disabilities to live independent lives while providing comprehensive care and training to positively impact the individual and our communities. The Brentwood Arts Exchange is proud to showcase Providence pottery products in our front window display. All products are hand-crafted, hand carved, and assembled by adults with developmental disabilities. Each participant earns a paycheck for the artistry they produce and sell. By purchasing a pottery item, you are helping to empower and provide greater independence for these adults with developmental disabilities. The Providence Center pottery facility is located in Arnold, Maryland. The Brentwood Arts Exchange is bringing "Reality" to the gallery. 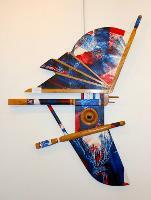 Project America's Next Top Master Artist is an elimination-style exhibition presented in three rounds. During each round, the audience will vote onsite and online to determine which artists will stay and which will go home. As they say on TV, "One day you're in, the next day you're out." Each artist who remains will bring new artworks to display to face audience voting once again. Each round kicks off with an event, from the Opening Reception, to Meet the Artists Night, and Meet the Judges Night. The exhibition culminates in a grand finale celebration on July 19, 2014, crowning America's Next Top Master Artist and awarding the winner a $500 cash prize and a solo exhibition at the Brentwood Arts Exchange during the 2014-2015 season. George Mason and James Madison Universities have a long-established reputation for excellence in the arts. Exchanged III brings art students from both universities together in the Gateway Arts District for the first time. This eclectic group of artists will present artwork in variety of media and viewpoints in this top-notch showcase of art by regional college students. Bill Harris creates artwork with consummate craftsmanship and powerful, clear-eyed social commentary. Perhaps best known as a printmaker, he is also an accomplished wood turner, and brings the two processes together in masterful wall-mounted sculptures that contrast exacting technical precision with vibrant color in complex, dynamic form. Area arts aficionados will at once recognize Harris’s work as understated yet powerful perspectives on Washington’s strong tradition of off-the-wall canvases and bold all-over treatment of color that anchors much of the regional art community. They are more than that, though. With references to flight as freedom, as well as bullets, arrows, African masks – sometimes with hair, and military-style medals, they speak about our community, history, and the ups and downs of social struggle. Given command of the entire Brentwood Arts Exchange gallery, Harris’ exhibition engages, challenges, offers space for interpretation, and if you’re open to it, teaches. Cianne Fragione’s art pours over with the physical material of paint and mark-making as an act of exploration. Her complex use of color and her layered covering up of forms create images that reveal themselves slowly and with great reward. An inheritor of the San Francisco Bay school of abstract expressionism, her paintings possess the unique quality of appearing large no matter what size they are. They carry a sophistication that can only be built through years of work in the studio; they are at once of the this time and also firmly rooted in the uniquely American abstract expressionist tradition. 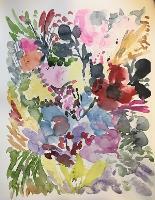 Her exhibition at the Brentwood Arts Exchange will present a selection of new works inspired by her residencies in Southern Italy, at Pennsylvania’s Soaring Gardens, and the landscapes and spaces of our own region. Led by artist Monica Jahan Bose, Her Words is a collaborative printmaking and story project celebrating women’s literacy in the remote island of Katakhali, Bangladesh, Bose’s ancestral village; and where Samhati, a Maryland-based non-profit, participates in an eco-project that empowers women. The women of Katakhali have recently learned to read, rebuilding their lives after devastating cyclones in 2008 and 2009. Bose has collaborated with 12 of these courageous women to create 18-foot-long woodblock prints on saris using words they have learned along with designs and images. The project also documents the lives of the women and records their oral histories through photo/video. This exhibition presents the creative outcomes of this art, literacy, and empowerment project to the U.S. audience for the first time. Artist's Si Jae Byun, Hedieh Javanshir Ilchi, Megan Mueller and Rachel Schmidt have strong themes of whimsy, structure, play and nostalgia that run through their artwork. These ideas manifest into forms of physical and imagined structures loosely based on habitable spaces that reference a memory, a nostalgia for something forgotten or unknown. Each artist has their own playful approach, and each comes to their creative process armed with a diverse range of media and materials. In Nostalgia Structures, Byun, Ilchi, Mueller, and Schmidt will present site specific installations, sculptures, and 2-dimensional works, many of which are being created for this exhibition. Each artist will address the concept of nostalgia, often with a heavy lean toward the autobiographical. Through this work, Nostalgia Structures becomes a dialogue between artists from Iran, South Korean and the US, speaking to fundamental concepts about how we see our life-scapes and how we choose to live within them. Ceramic Sculptor Christina Osheim, painter Benedict Oddi, and sculptor/draftsman Allen Linder exhibit together for the first time in this exhibition curated by Brentwood Arts Exchange staff. Although working in different forms and media, each artist shares sensibilities in their exploration of imagination and 21st century inheritance of early-mid 20th century surrealism. Allen Linder, widely known as a sculptor and represented by galleries across the U.S., will show recent drawings and two dimensional work. Benedict Oddi is the head of the Painting Department at Tennessee Technological University, and will be exhibiting in the Metro area for only the second time. Christina Osheim received an MFA from the Cranbrook Academy in 2012, and is currently a studio artist at the regional visual arts powerhouse Red Dirt Studios. For more than 120 years, the Corcoran College of Art and Design has been a leading force cultivating and driving the visual arts in the Washington metropolitan area. Their students are among the best and brightest, and their alumni number among the most distinguished artists in the canon of American art. This one-week pop-up show invites the 2013 graduating class to take over the Brentwood Arts Exchange gallery for showcasing of their artwork. In celebration of Black History Month the Brentwood Arts Exchange presents "Show Me What You're Working With!," an exhibition of artworks by members of Black Artists of DC (BADC) from February 11 – April 6, 2013. The exhibition is specifically intended to give artists a chance to present themselves as who they are and what they do, rather than limiting or interpreting work to fit a specific theme. It's a chance to see what each artists considers his/her best work, how they see the world, in a celebration of the many voices and visions that comprise The Black Artists of DC. Featured artists include Daniel Brooking, Melvin Campbell, Jay Durrah, TH Gomillion, Carolyn Goodridge, Wanda Hardy, Francine Haskins, Ester Iverem, Hubert Jackson, Gloria Kirk, Jacqueline Lee, Magruder Murray, Victoria Paytonwebber, Russell Simmons, Simone Spruce-Torres, Eugene Vango & Ann Marie Williams. Established with the purpose of creating a community of support for Black artists, BADC exists to promote, develop and validate the culture, artistic expressions and aspirations of past and present artists of Black-Afrikan ancestry in the Washington, DC metropolitan area. Founded in 1999 Black Artists of DC (BADC) began when three artists: Viola Leak, PLANTA and Aziza Claudia Gibson-Hunter decided to address the lack of communication and support between local Black artists. BADC has grown since then to over 400 members, associates and supporters from every discipline; who at one time lived, were educated, or worked in the Washington DC metropolitan area. The mission of Black Artists of DC (BADC) is to create a cooperative trans-generational training ground for Black artists. By sharing resources and teaching the disciplines of artistic expressions we ensure the continued enriching contributions of Black artists and build upon the solid foundation of the past. 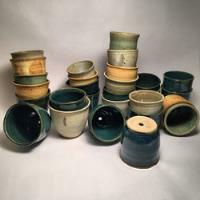 The Brentwood Arts Exchange presents its winter Front Window Featured Artist, local potter and sculptor, Matt MacIntire. 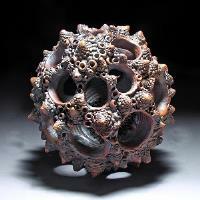 Matt’s coarse wood-fired vessel sculptures will be featured in the craft store’s front windows from February 11 – April 6, 2013. Inspired by primitive tools and ritual objects, Matt’s work recalls ancient tribal paintings and artifacts found in the caves of southwestern Europe. The alternating mix of textures, tones and surfaces combined with MacIntire’s playful execution will make visitors to the craft store crave a second look as they long to touch the ceramic works that bridge so many opposing visual and conceptual elements. The Brentwood Arts Exchange presents "Mentor + Mentee II: Maryland Edition" in the gallery from December 3, 2012 – January 26, 2013. This exhibition presented in partnership with the Washington Printmakers Gallery (WPG), features artwork by ten of WPG’s members as well as the artwork of their mentors and/or mentees. First presented by WPG in the fall of 2009, Mentor + Mentee II is a continuation on the theme and emphasizes the gallery’s Maryland membership. A collaboration between student and teacher, "Mentor + Mentee II" is an insightful look into the presenting artists’ creative foundations. Featuring artists include Lila Asher & Bill Harris, Yolanda Frederikse & Betty MacDonald, Jenny Freestone & Scip Barnhart, Pauline Jakobsberg & Rachel-Ray Cleveland, Trudi Y. Ludwig & Raj Bunnag, Marian Osher & Joyce Jewell, Anne McLaughlin & Lexi Lopez, Terry Svat & Elzbieta Sikorska, Max-Karl Winkler & Naul Ojeda, Clare Winslow & Carolyn Hartmann. Washington Printmakers Gallery (WPG) is a cooperative print gallery founded in Washington DC in 1985 by a group of local printmakers. WPG is dedicated to the display and sale of its members' artwork and to educating the public about the history and future of the original print. Known as the greater DC metro area's primary source for artist-pulled fine art prints, WPG boasts a membership of exceptional local and national printmakers. 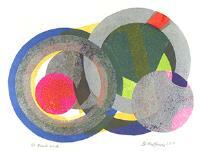 Every month Washington Printmakers Gallery has a group exhibit of members' work and a solo show. The gallery also houses bins and flat files with prints and a limited collection of artist books and portfolios. This exhibition opportunity held in partnership with the Brentwood Arts Exchange continues WPG’s mission of educating the public about the art and history of printmaking. Agendas: Concepts and Thematics in Sculpture’s Expanded Field—Community Engagement. Opening Reception, Saturday, September 22, 2012. The Brentwood Arts Exchange in partnership with the Washington Sculptors Group (WSG) presents Agendas, an exhibition of contemporary sculpture by WSG members, juried by Teresa Bush of Howard University. Agendas uses sculptural form to address the relevance within our present day society of global forms and ideologies, such as cross cultural borrowing, the adaptation of pluralized artistic forms within postmodern discourse, and the experience of emergent populations within our communities. 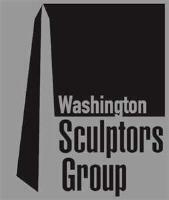 The Washington Sculptors Group is a non-profit corporation founded to promote awareness and understanding of sculpture and to foster the exchange of ideas among sculptors, collectors, and the general public. WSG, singly and in cooperation with other organizations, plans, manages and promotes important curated exhibitions in galleries, museums and alternative spaces in the Washington metropolitan area and beyond. The Brentwood Arts Exchange presents Express Yourself! 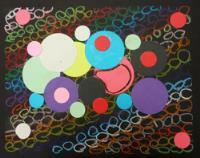 A Teen Juried Exhibition from June 25 - August 10, 2012. Featuring artwork in all media by young artists ages 13-18, this exhibition promises to showcase the best in visual art submitted by teens from the Greater Metropolitan region. Artwork submissions will be judged by Artist and Corcoran College of Art & Design Associate Faculty member, Joey P. Mánlapaz. Of those chosen to exhibit, three will have a chance to win cash awards. Our first teen exhibition, Express Yourself! will prove to be an eye opening and unforgettable experience, giving participants a glimpse into the art world all the while validating their artistic talents. 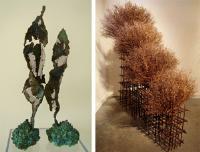 The Brentwood Arts Exchange presents a captivating exploration of disparate materials and natural forms in this show of sculptures by Laura G. Thorne and Marcia Wolfson-Ray. Thorne combines steel, aluminum, glass, ceramic, and found, natural materials to create objects that are deeply imbued with mystery, at once familiar and alien. Baltimore-based Marcia Wolfson-Ray builds three dimensional rhythms and patterns from grasses, reeds, bamboo, and other dried plants collected from marshes, fields, and vacant city-lots. Each working in her own way and own directions, their work comes together in an irresistible harmony in their embrace of mystery and improvisation and their surprising ability to fascinate us through forms that we may have seen elsewhere under different contexts, but never quite like this. 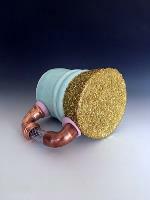 A ceramicist and educator, Susan O’Brien’s work incorporates decoration, ornamentation, humor and function. Informed by the history and evolution of dining wares and rituals, her pots express nostalgia for both communal celebration and virtuosity in craftsmanship. 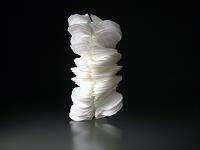 Her work is an amalgamation of classical form and the unexpected. 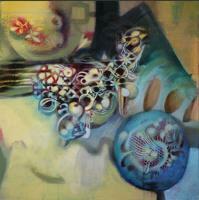 The Brentwood Arts Exchange is honored to present the artworks of Lillian Burwell and E.J. Montgomery. Both highly accomplished artists, Ms. Burwell and Ms. Montgomery have been prominent figures, influential throughout the art community for several decades. Each with their own approach their artworks are a lyrical, rich, and highly developed explorations into the expressive potential of color and space. After serving nearly four decades as a Professor of Art at the University of Maryland, Tad Lapinksi has left an indelible mark on the art community and built an inestimable legacy of influence on countless students. In collaboration with the UMCP Art Department, the Brentwood Arts Exchange honors Mr. Lapinski’s contributions with a solo exhibition of his brightly-colored, vibrant abstract prints. We are humbled to be in the company of such prestigious institutions as the National Gallery of Art, the White House, Museum of Modern Art, San Francisco Museum of Art, the Museum of Modern Art Tokyo, and Tianjin Museum in China, among many other museums throughout Europe, Asia, North and South America that have exhibited Mr. Lapinski’s work. All ages; FREE. The Brentwood Arts Exchange is pleased to host The Sky’s the Limit, the 2011 Prince George’s County Juried Exhibition, featuring works in all media that incorporate photographic techniques. Photographic imagery is ubiquitous in nearly every aspect of our lives, from billboards, to cell phone videos, to keepsake albums, to Facebook profiles. It’s no coincidence that it is just as pervasive throughout contemporary art – even in media that are often thought of in stark contrast to traditional photography. The Sky’s the Limit presents a glimpse of the ways photography employs itself throughout the visual arts, here and now. Juried by Michael Platt, the exhibition presents the best photo-inclusive art by artists who live, work, or study in Prince George’s County. Hosted in the Gateway Arts District for the second time, this Prince George’s County Juried Exhibition is our chance to show off the important contributions that artists in our county make to contemporary art throughout the region. All ages; FREE.